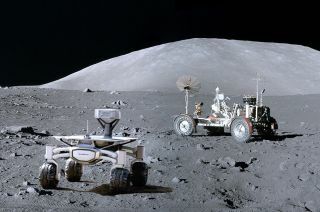 Artist's rendering of PTScientists' Audi lunar quattro rover driving to the Apollo 17 lunar roving vehicle on the moon. A Berlin-based group of rocket scientists and engineers are aiming to land a pair of privately funded Audi-branded robotic rovers on the moon and drive them to inspect NASA's Apollo 17 lunar roving vehicle, marking 45 years since humans last drove on another world. PTScientists (Part Time Scientists), one of 16 teams still in the running for the $30 million Google Lunar XPRIZE, has been developing its Autonomous Landing and Navigation Module (ALINA) lunar lander and Audi lunar quattro rovers since 2008. Now, the team has secured a launch contract with Spaceflight Inc., a rocket rideshare broker in Seattle. PTScientists' Audi lunar quattro rover seen during qualification tests for its 2017 mission to the moon. PTScientists plans to land its rovers in the moon's Taurus-Littrow valley, the last place humans set foot on the lunar surface in December 1972, in the hopes of getting a closer look at how the Apollo moon buggy has survived over the past four and a half decades in the extreme temperatures and inhospitable conditions on the moon. "There is a reason we have chosen the Apollo 17 landing site," Karsten Becker, PTScientists electronics head, said in a call with reporters on Tuesday. "That is because the Taurus-Littrow valley is geographically very interesting — that is why it was chosen for Apollo 17 — but it is also a very well documented site. There are many pictures where you can see that it is very flat, and that there are not that many stones laying around." The landing site has been chosen to be within reach of the Apollo 17 site, but not so close that it could risk damage to the NASA preservation heritage area. "We want to land 3 to 5 kilometers [2 to 4 miles] away from the [Apollo 17] landing site," said Becker. The Google Lunar XPRIZE, which was first announced in 2007, will reward the first privately funded mission to the moon that is able to drive 500 meters (0.3 miles) and send back HD video to Earth. There is a bonus prize offered for teams to image the Apollo landing sites. Apollo 17 commander Gene Cernan, the "last man on the moon," talks with members of the PTScientists moon mission team. PTScientists' goal of driving to and imaging the Apollo 17 landing site has earned the support of the only two people who've been there, astronauts Gene Cernan and Harrison Schmitt, although their support came with a condition. "Cernan said the team is not allowed beat the lunar speed record he set while on the moon!" stated PTScientists in its release. Working with German automobile manufacturer Audi as its technology partner, PTScientists has built two lightweight, solar-powered rovers capable of collecting data and high-definition video. The Audi lunar quattro features four-wheel drive and active suspension, which will help it navigate the regolith-covered surface. "We're more used to designing cars on Earth, but when we heard what the PTScientists were planning, we wanted to support them," said Audi project director Ulrich Schwarze, "by sharing some of the knowledge we have built up over decades of vehicle design and manufacturing." The Audi lunar quattro rover's projected maximum speed is 2.2 mph (3.6 km/h) — so Cernan can rest easy that his 45-year-old record is safe for now. Two stereo cameras, to acquire 3D images, are mounted to a moving head at the front of the vehicle. The rover's third camera will be used to study materials and to capture panoramic images. Many of the rover's components are made of high-strength aluminum. A swiveling solar panel will capture sunlight to power the wheel hub motors. All four wheels can rotate 360 degrees. PTScientists do not yet know which commercial rocket will launch the ALINA lander and Audi rovers. Its arrangement with Spaceflight, Inc. — pending its confirmation by Google Lunar XPRIZE representatives — will make PTScientists the fourth team to secure a launch contract, after the Israeli SpaceIL, U.S. Moon Express and international Synergy Moon teams. The four-legged ALINA is capable of transporting up to 220 lbs. (100 kilograms) of payload to the moon, which is enough to carry the pair of Audi lunar quattros and still have room for scientific and commercial payloads. PTScientists has agreements to deliver payloads from the U.S., Canada and Sweden, and continues to market the opportunity. "If we succeed, we'll have done something that previously only governments have been able to do," stated Bohme. "We want our mission to inspire others." Watch international best-selling author Frank Schätzing describe PTScientists' and Audi's mission to the moon at collectSPACE.